I like to write poem. I like to write prose. The first article published here is something about the ‘David’ and me — David. Any response are strongly welcome. Michelangelo broke away from the traditional way of representing David. He did not present us the winner with the giant’s head at his feet and the powerful sword in his hand, or try to depict us a nearly womanlike youth with a hat wearing posture. Instead, Michelangelo placed his ‘David’ in a most perfect and affectionate poise in which the two important virtues of the ancient patron city of Hercules, ‘Strength and ‘Wrath’, were embodied. These lofty virtues, coincidently, were the essential elements that the newly formed political community required. concept of the ‘Renaissance individualism’ that influences the creative trends of the artists later. The most important and memorable event for the Florentines in 1501 was not only the formation of the new Government, the Republic of Florence, but also one of the greatest statues that they can be really proud of, David, was in the process of being sculpted. Michelangelo, a genius artist acknowledged already as the foremost sculptor of his day, was given a commission by the new Republican Government to chisel a statue from an abandoned large block of marble left in the Cathedral in Florence. In 1464, Agostino di Duccio had been commissioned to execute the statue from the same block, but he did nothing, and nor did his follower, Antonio Rossellino, in 1476. The task, therefore, seemed to be obstinate and problematical. It was thought that the block was practically worthless and that nothing worthwhile could come of it. However, even a stone could become a piece of gold in the hands of a genius. Michelangelo decided to carve a statue, David, symbolizing that just as David, the king of Israel in the ancient kingdom, had protected his people with unrelenting strength and governed them with the wrath of justice, so would whoever was entrusted with ruling Florence. The decision to carve the statue, David, was not a mere coincidence making use of a large block of discarded marble, but represented a desire and yearning of the Florentines. From the previous century onward, David the shepherd boy who became king of Israel by defeating the tyrant, was a common motif in Florence. He was a warrior as well as a ruler, who united the kingdom of Israel and re-captured Jerusalem for his people. More importantly for the Christianity of Florentines, David not only seemed to prefigure Christ, symbol of salvation, but according to the Book of Matthew, he was also Christ’s direct ancestor. Thus, it was not surprising that the Florentines could accept a young, justice figure like King David as their traditional symbol of the city-state. 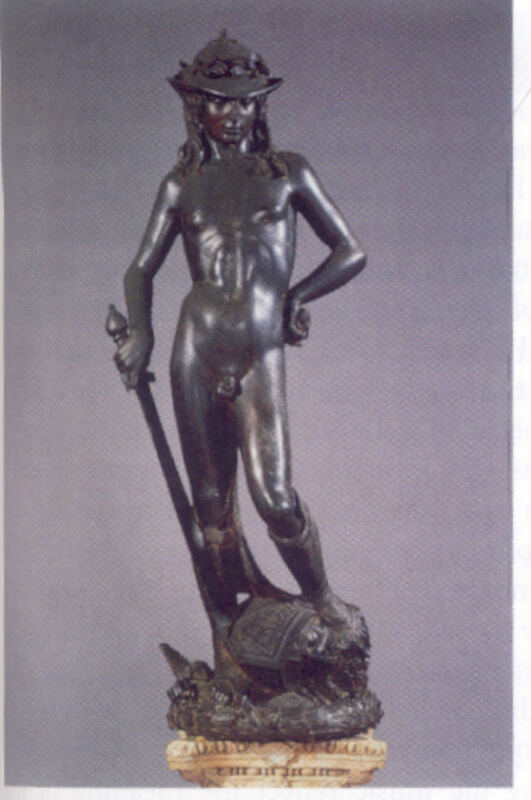 Furthermore, the bravry, courage and righteousness of warrior David portrayed by Donatello and Verrocchio in their sculptures had successfully rooted in every mind of the Florentine. As such, the newly established Republican Government really required ‘David’ to represent the triumph of the People’s Republic over the tyrant. The defeat of the fierce giant Goliath by King David symbolized the successful revolution of the common people against the Medici family of the stronger side, and also her monarchic rule of the city for over a half century. Doubtless Michelangelo’s David breaks away from the traditional way of representing King David. 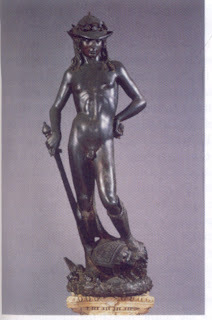 He does not present us with the young winner with the giant’s head at his feet and holding the powerful sword in his hand, somewhat like the style of Verrocchio, nor a tenderly feminine-liked figure of not more than two meters height, wearing a hat and standing sensuously which is in the style of Donatello, after the battle with Goliath. Michelangelo’s David is a mature young man, more like a statue of Goliath than the ruddy shepherd boy with a sling. He portrays David in the phase immediately preceding the battle. Perhaps, this is the moment that his people are hesitating and getting frightened, while giant Goliath is jeering and mocking them. The strength of David is felt not only in his muscular arms and mature body, but also from every nuance of flesh and detailed facial expression. Without depicting any vigorous and energetic action, the sculptor skillfully conveys the impression of the unrelenting strength, or even the wrath of justice, through the sparkling eyes, the frowned forehead, the closed lips, and the tightened eyebrows of David to viewers. The determination and courage of David are easily felt. Michelangelo’s ‘David’ could overcome any difficulties laid ahead without any hesitation in order to protect his people and maintain justice in the country, so as could the Republican Government. directs the viewer to look in the direction, the left side, from which attack may come. His left hand is ready to fight against any enemy with the sling and even his body, his left foot, turns and steps a bit leftward opposing the open, relaxing right side. The underlying idea of Michelangelo’s David is clear. This is the David of watchfulness, faith and hope. He represents the essence of all civic virtues, the courage, fortitude, faith and far more important, the ‘Strength’ and the ‘Wrath of justice’ that came from these virtues. All these qualities possessed were also the essential elements required for fortifying and unifying the newly established Republican Government and the people of Florence. W. Fleming, Arts & Ideas, 9th ed., Forth Worth: Harcourt Brace, 1995, p284. Linda Murray, World of Art: Michelangelo, Singapore: Thames & Hudson, 1992, pp40-41.